"I enjoy this omelet served on top of toast. Use any type of cheese you like - Swiss and Gouda are both good choices." 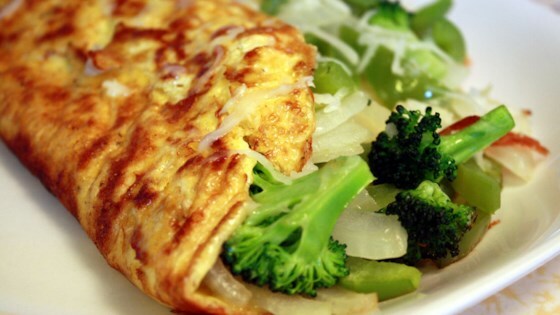 Sprinkle the cheese over the omelet and spoon the vegetable mixture into the center of the omelet. Using a spatula gently fold one edge of the omelet over the vegetables. Let the omelet cook for another two minutes or until the cheese melts to your desired consistency. Slide the omelet out of the skillet and onto a plate. Cut in half and serve. A couple simple techniques are all you need to make perfect omelets. I am certain this recipe is good... but there is nothing "veggie" about it! Butter, cheese, eggs..... and look at the cholesterol! Wow!